The audio company’s first collaboration with a car manufacturer, Monster presents the Lamborghini Veneno Roadster equipped with the company’s high end audio system. 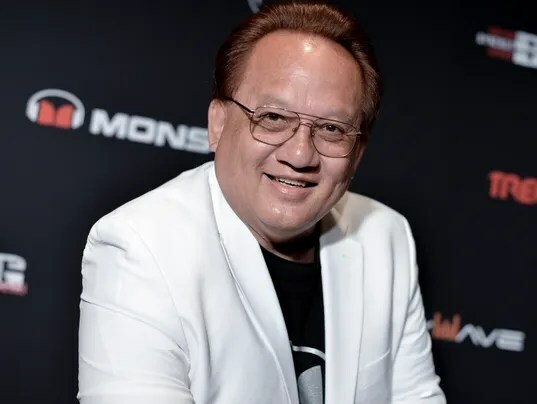 This special audio system will feature Monster’s breakthrough technology Pure Monster Sound, specially tuned by Noel Lee, the audio innovator behind the sound of Beats by Dr. Dre headphones, to bring the full experience of live music to the road. For more information head on over to Business Wire. Three weeks ago, hip-hop star Andre Young — better known as Dr. Dre — made news as his Beats Electronics line, a maker of premium headphones, was valued at more than $1 billion thanks to an investment from the Carlyle Group. But the former N.W.A. rapper is not the only one profiting from his headphone line. Across the Pearl River Delta in southern China, counterfeit Beats are flowing out of factories, assembly workshops and shops, attracting businesspeople that sell the headphones on global markets. A CNN reporter approached wholesale companies about buying in bulk in order to learn how the underground sale of knock-off headphones works. 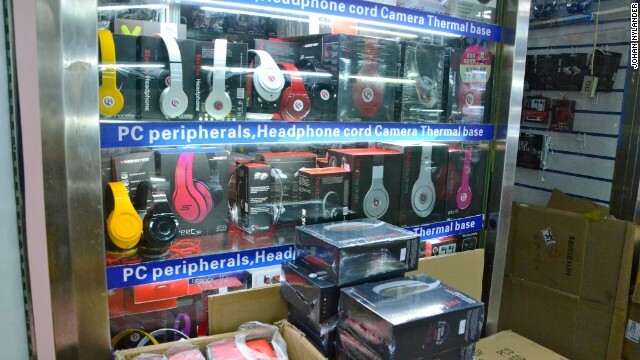 “Business is very good,” said a woman, who, with her family, runs a wholesale company selling copied headphones in one of Shenzhen‘s many mega-malls. “You buy cheap from me, you sell expensive in your home country, we all make a lot of money,” she added. To prove her point, she shows an Excel spread sheet on her laptop listing customers from all over the world: Italy, Denmark, United States, Canada, Dubai, Russia and more. She said she recently sold a large amount of counterfeit Beats by Dr. Dre for $50,000 to a British businessman who sent them to the UK by jet — which is considerably more expensive than container ship — and sold them as originals. While top-line Beats headphones retail for $400, the Shenzhen operators interviewed sell knock-off versions wholesale for $70. “A lot of people are making a lot of money on Beats right now,” she said. Factory owners here have a nose for what’s hot and what’s not. Nearly 70% of all fake goods — including DVDs, clothing, and electronics goods — seized worldwide from 2008-2010 came from China, according to the World Customs Organization. And looking at the shops in Shenzhen’s Huaqiangbei commercial district — a destination for buying electronics, especially fakes — Beats by Dr. Dre are definitely hot, prominently displayed next to iPhones, Samsung gear and Nikon cameras. To look at them, some are clearly fakes with poor packaging and logo color schemes that are wildly different from those well-known products. At another Shenzhen store, a sales executive at a factory and trading company, connects a pair of fake Beats Pro to her iPhone and puts them on the reporter’s head. The sound quality is surprisingly good. In the U.S., an original pair would cost $400. She offers her best quality headphones for the wholesale price of $70, medium quality for $45 and “so-so quality” for $30. “Medium quality is most popular, but the trend is going towards high-end. Consumers want good sound,” she said, adding that she can deliver 100 units of any Beats product by the following day. For 1,000 items it will take a week. “Since it’s copies, we don’t want to have too much in stock,” she said. On the streets and down in the subway, in-ear Beats headphones are sold for as little as $1. According to the company website, real in-ear Beats sell for $100 and up. Beats Electronics, the company behind the Beats by Dr. Dre brand, said that the company shows “a fierce commitment” to fight piracy and that it works in close collaboration with anti-counterfeiting organizations, police and customs authorities to identify counterfeit sellers, distributors and manufacturers on key markets. 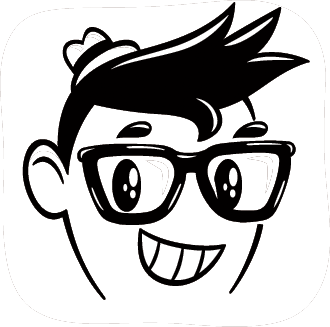 They also scan online marketplaces for unauthorized use of Beats trademarks. “Since efforts began, Beats has seized hundreds of thousands of counterfeit products in more than 50 countries,” the company said. The U.S. government has long complained about the theft of intellectual property in China… However it appears that Chinese officials are moving to crack down on counterfeit trade. 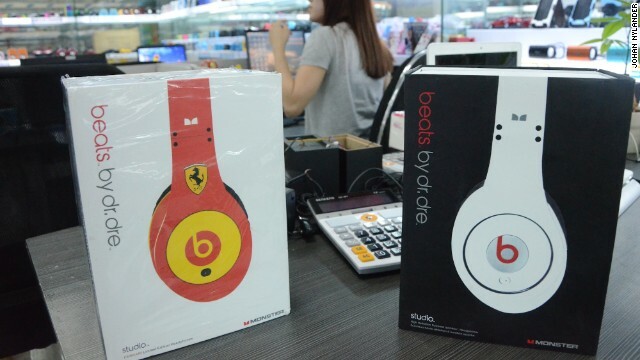 A month-long joint operation with U.S. Customs in July resulted in the seizure of more than 243,000 counterfeit products using trademarks from Beats by Dr. Dre., Apple, Blackberry and Samsung. U.S. Customs and Border Protection said the operation was the biggest bilateral customs enforcement effort ever conducted by the U.S.